This trendy DeLonghi Distinta Toaster is the ultimate kitchen appliance both in style and function. 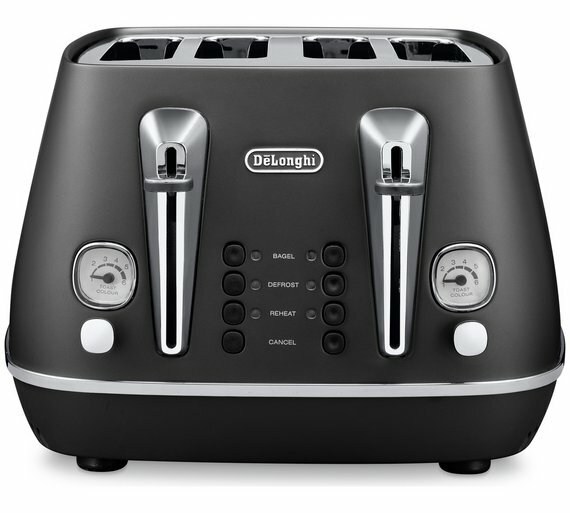 With a sturdy design, chrome plated details, and metallic finish, you can even toast four slices at a time. With regulating controls such as reheating, defrosting and cancel and also browning control. The neon indicators light up at every action while, the lift position makes it convenient for you to retrieve the slice when it is done. The touch points in this bread toaster are metal wrapped to ensure safety, while the removable crumbing tray prevents the mess from building up. Complete with non-slip feet ideal for kitchen counters or dining table tops.